'Tis the season for giving gifts, being with family, and... declaring your fealty to Eldritch Horrors? 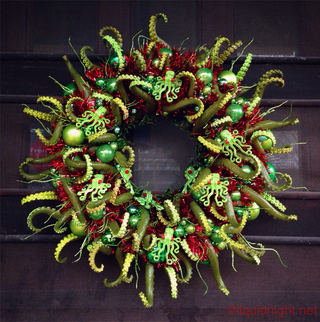 You could do all of those things at once by taking a leaf out of Maika Keuben's book over at Geyser of Awesome and making your own amazing Cthulhumas wreath. You can see more of Maika's Cthulhumas Crafts on her instagram - including Cthulhu Christmas Cookies!